Whenever this reviewer reads a new book by Gilian Dye, it is with the assurance that some questions never asked will be answered, and these precious nuggets of newfound knowledge will delight. 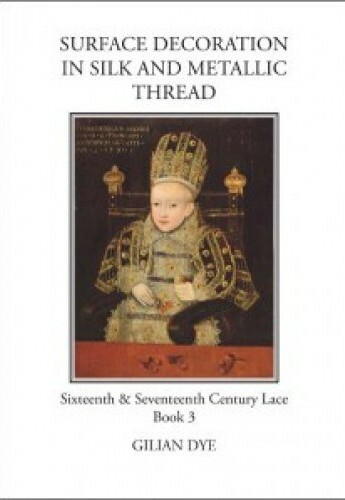 So it is with this third book in her series devoted to 16th and 17th Century laces. Here are 60 pages that anyone who has been reading my book reviews covering this historic period will welcome. Especially, if they would like to reproduce laces seen in portraits, pattern books, rare surviving laces, and so forth. She is now working on a fourth book, which will feature insertions and wider linen edgings than those in the Isham book. What en elegant gift this book and some gold thread supplies would be for a dear friend! Gil Dye has puzzled out all the stumbling blocks modern lace makers encounter in Le Pompe (1559) and Nüw Modelbüch (1561) for her bobbin lace-making audience. She gives a list of 21st Century metallic threads that will give good results, and offers a method for making tear-drop-shaped spangles (sequins), since they are not commercially available today. Modifying bobbins for use with metallic threads is described and pictured. There is even a beginner pattern that requires only 4 bobbins, thread, and a strip of graph paper. Not exclusively for intermediate-to-advanced bobbin lace makers. Detailed diagrams come in handy for study of tricky bits, such as 5-sequin tassels. The results are mesmerizing. It is great fun to follow the text by looking up portraits and antique samples via computer. The small boy (Prince Henry Frederick in 1596) pictured on the cover was born a Stuart (Mary Queen of Scots' grandson), but during the reign of Elizabeth I - a Tudor. The lavish use of gold laces on his clothing does not surprise, for he would have succeeded his father James VI (of Scotland) and James I (of England) as king, if not for his death as a youth. This, of course, reminds of the book The Tudor Child, reviewed in September, which can be read in Arachne archives - address at bottom of this review. The October 2013 "Lace" bulletin #142 p.6 announces a Lace Guild-sponsored course: Lace at Hardwick Hall with Gil Dye, 17-18 May 2014. It is related to this new book, and will be a lovely Spring treat for lace makers in England.